If you’re like me and live in the Midwest, journeys to saltier waters may be hard to come by. There are many Midwest anglers who’ve never inshore or offshore fished, and have been missing out on some of the best fishing around. If you’re one such angler and are planning a saltwater trip, it may be beneficial to learn a bit about some of the common species to be caught. 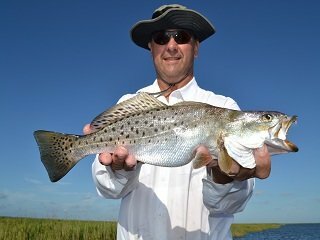 For this reason, today’s Fish File spotlights one of the most popular saltwater species, the speckled seat trout. Commonly found in the waters of the Gulf of Mexico and along the East coast, where they can be caught inshore among weeds and marshes, as well as in deeper waters where offshore oil rigs dot the horizon, speckled trout (specks) are as popular in saltwater as largemouth bass are in freshwater. Adults usually grow between 19-25 inches (between 2-4 pounds) and are easily identified by their silvery coloration and distinct spots along their backs. They also have pronounced canine teeth on the top of their mouth. A speck’s diet usually consists of shrimp and other crustaceans, but also includes mullet and other smaller fish. Specks can be caught using a number of techniques. Spinning and fly gear are popular options, and anglers use a variety of live and artificial baits to pull them to the boat. Perhaps the most popular bait is live shrimp, due to the fact that it makes up a large part of the trout’s diet. Fishing live bait—shrimp or mullet—beneath a cork popper yields great results. Artificial lures that have proven deadly for sea trout include spoons, grubs, and plugs. If you stumble upon schools of specks, tandem rigs are a great bet, especially if you’re taking them home in a cooler. Fly anglers will have good luck with poppers and streamers. While specks strike a lure with a ton of force, their mouths are actually quite fragile. In fact, most anglers miss out on fish because they set the hook too hard or try to muscle the fish to the boat, which commonly rips a hook free. The trick when angling for specks is a soft hook set and patience when reeling them in. Keep an eye on your drag and allow the fish to wear itself out. Like most saltwater fish, speckled trout are exciting to fish for and taste great when cooked. If you find yourself in speck territory anytime soon, I highly suggest seeking out this worthy fish. Not only will you have fun reeling them in, but your dinner table will be home to a delicious meal at the end of the day, which is always a bonus!